It’s the time of the semester where everyone is very stressful due to last assignments, presentations and the impending finals. To prepare you for the uphill challenge, BME club will be giving away welfare packs! 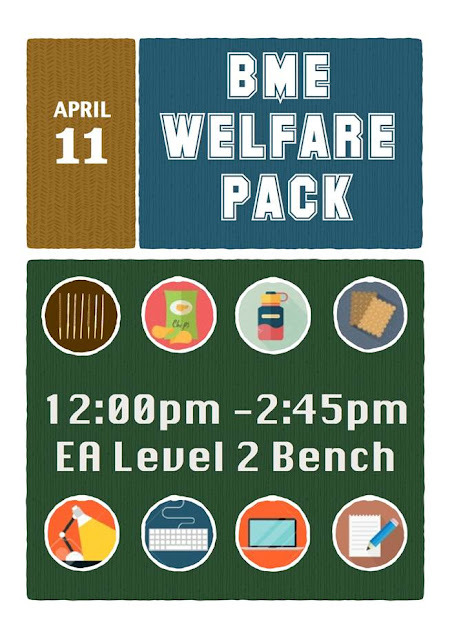 We will at EA Level 2 Bench on 11 April (Monday) from 12noon onwards! All you have to do is bring along your matriculation card. We hope to see you soon and all the best for your finals. Come join us on our annual BME Day! 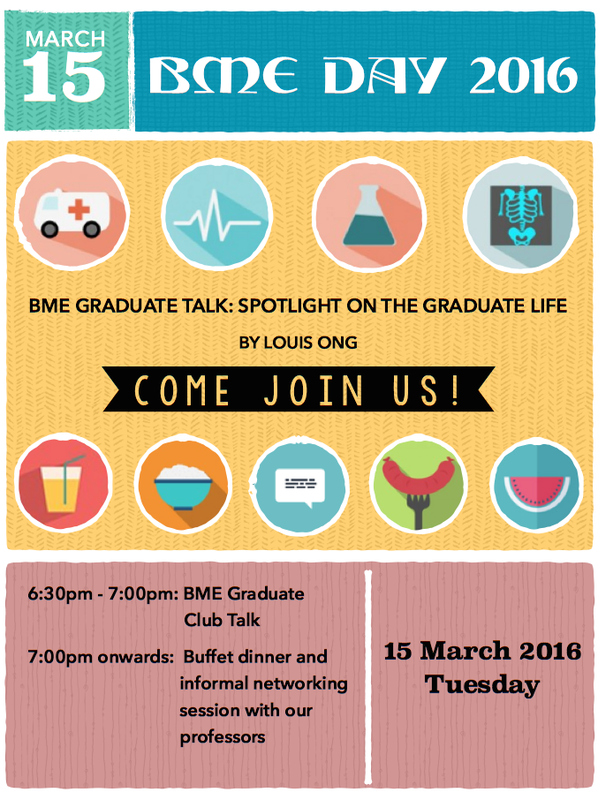 If you're wondering what graduate life is all about, there's a talk starting at 6:30pm at EA Auditorium just for you! Enjoy a wide spread of food afterwards at our buffet dinner and talk with the professors! We are pleased to announce the dates and plans for the annual BME exchange trip! This year, we will be heading to KOREA and TAIWAN. Students will be staying over with the partnered universities to learn the BME field in the respective countries. It is a great chance to be exposed in the biomedical industry and have fun! It’s the time of the semester where everyone is very stressful due to last assignments, presentations and the impending finals. 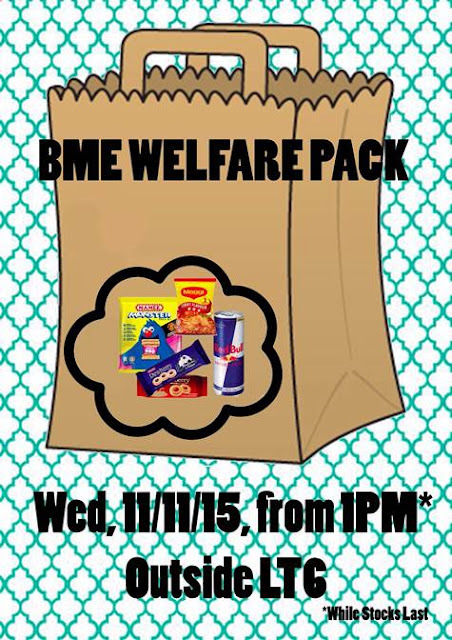 To prepare you for the uphill challenge, BME club will be giving away welfare packs! We will be outside of LT6 at 11/11/2015 (Wednesday) from 1pm onwards! All you have to do is bring along your matriculation card and the fastest 100 students will receive a can of Redbull. We hope to see you soon and all the best for finals. Hello to all BME students! 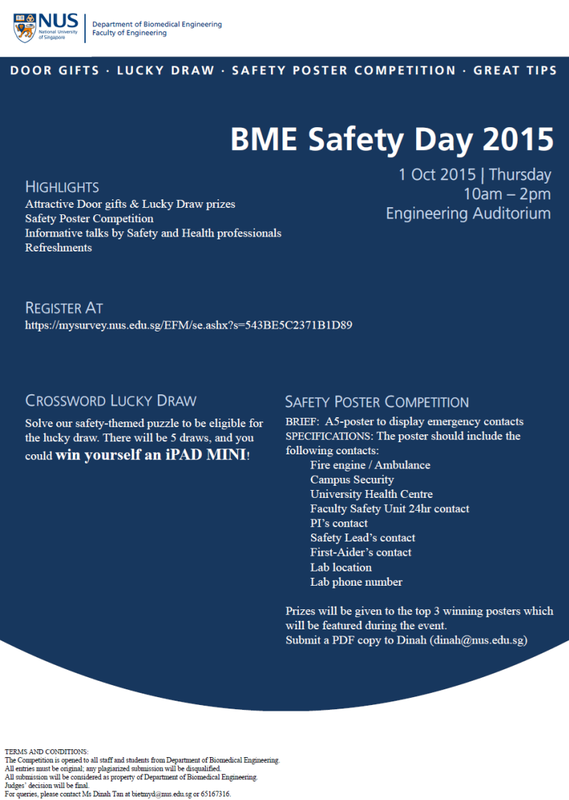 The annual BME Safety Day will be held on the 1st of October 2015. There will be a safety poster design competition held in conjunction with the safety day! If your design skills are awesome, do participate and stand a chance to win prizes for the top 3 posters! AND! Crossword lucky draws to win an IPAD MINI! If interested, further details are given below! Do hurry and register yourself today! 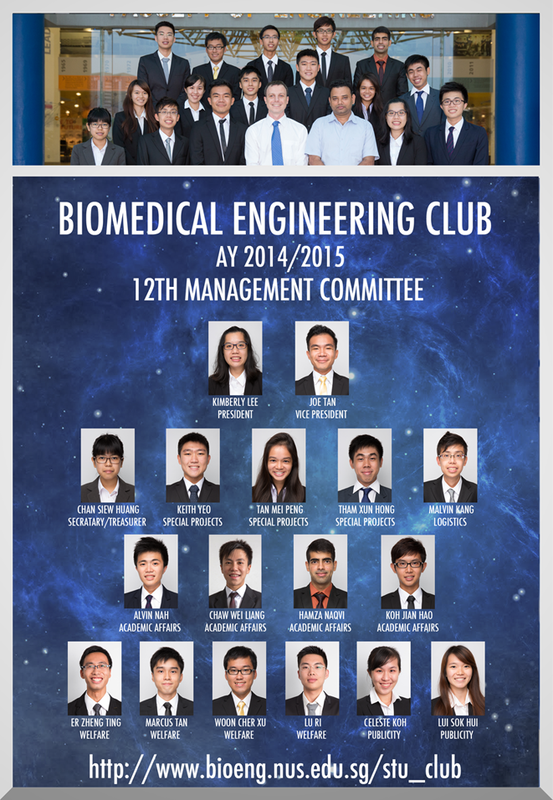 The BioMedical Eengineering Club, BME Club is one of the representative Engineering Clubs in National University of Singapore. It is the sole union representing all undergraduate students in the Department of BioMedical Engineering. Since its establishment in 2003, the club has been actively serving the whole BioMedical Engineering undergraduate population and growing with the increasing number of undergraduates. 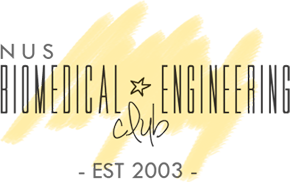 Fostering goodwill and cultivating bonds among the BioMedical Engineering students in various aspects, such as academics and career, are what BME Club has always been trying to achieve. 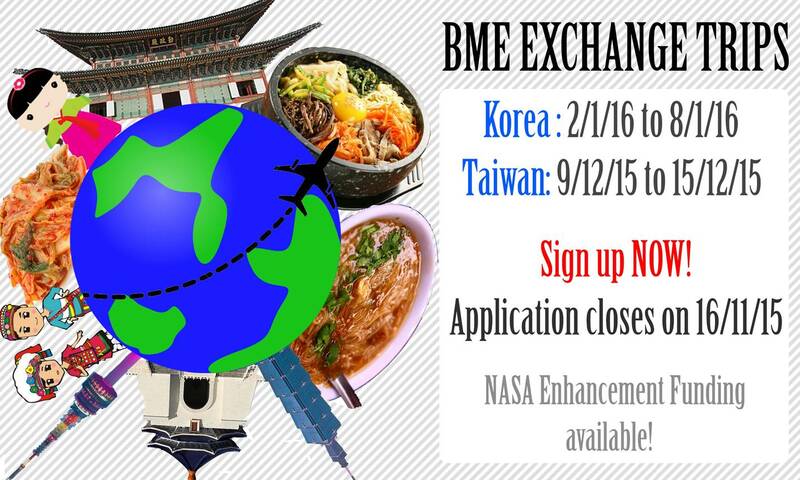 BME Club provides a platform where the students can interact with other students. Such interaction allows the students to share their experience and broaden their knowledge. To serve the bioengineering students in various aspects such as academic study and career. 1. Promote interaction among students and staff, building bonds and giving them life-long memories. 2. Facilitating communications between the Department and students. 3. Promoting Bioengineering as a distinct and prestigious discipline and profession. 4. Assisting Bioengineering Students in their academic developments.